My goal here was to find a pocket sized charger, something that could be fitted into any pocket and (hopefully) forgotten about, ready to deliver a thoroughly modern 3A over USB Type C, to my flagship Lumias and other Windows 10 Mobile devices, plus the occasional 2017 Android handset. 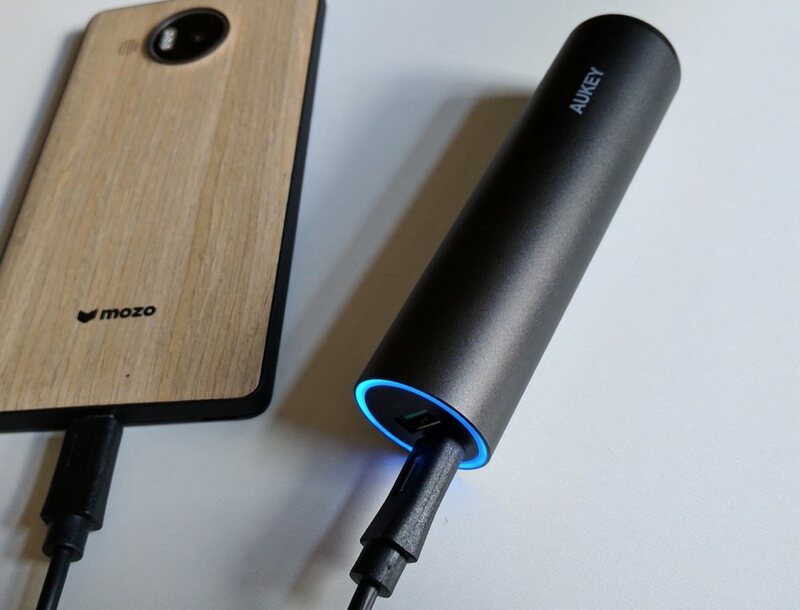 You'll remember that delivering 3A at 5V is part of the 'Power Delivery' part of the USB Type C specification - the Qualcomm multi-voltage 'Quick Charge' system is an alternative, though often working over the same physical cables and connectors. There's no Quick Charge compatibility here, but it matters not a jot, since this is all at 5V and high current and is much 'purer' Type C by my reckoning. In fact, prior to finding this accessory, I gave this AUKEY alternative a whirl, since it was ONLY Type C. In and out. That's your lot. Sadly, it was unremarkable, using 'boring' LEDs for charged status, with a low tech button to kick off charging, with a wobbly USB Type C port, and - as it turned out - not having a USB Type A port as well made the accessory too limiting. Many of my USB Type C cables and adapters have Type A (i.e. standard 'old' USB) at one end! 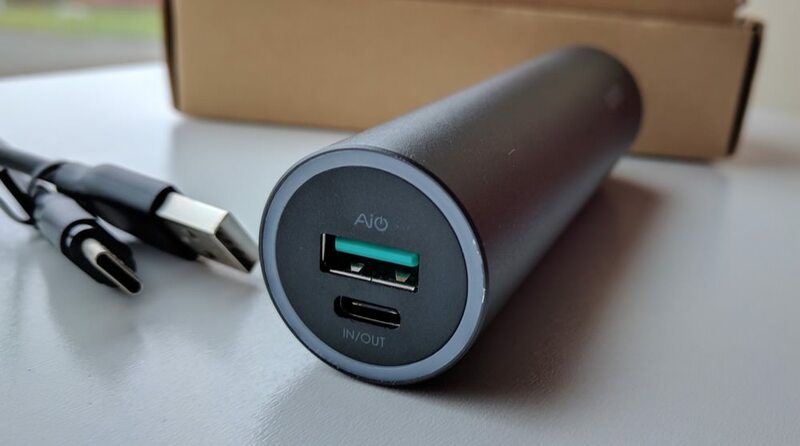 I'll review this alternative AUKEY too in a shorter 'Flow' story if there's enough interest. But on with the 'Halo' power bank here. It's styled like a small flashlight, in a tough metal cylindrical shell. Curiously, there's no LED torch built-in - you'd have thought that this would have been an easy and obvious natural 'extra' to have thrown in, though admittedly you'd then have needed a button to control the torch, and one of the USPs here is that there is no button. In fact, there are no traditional power bank status LEDs either. Just a colour changing ring LED, hence the 'Halo' title above. This USP turns out to be really, really handy, not to mention looking cool. 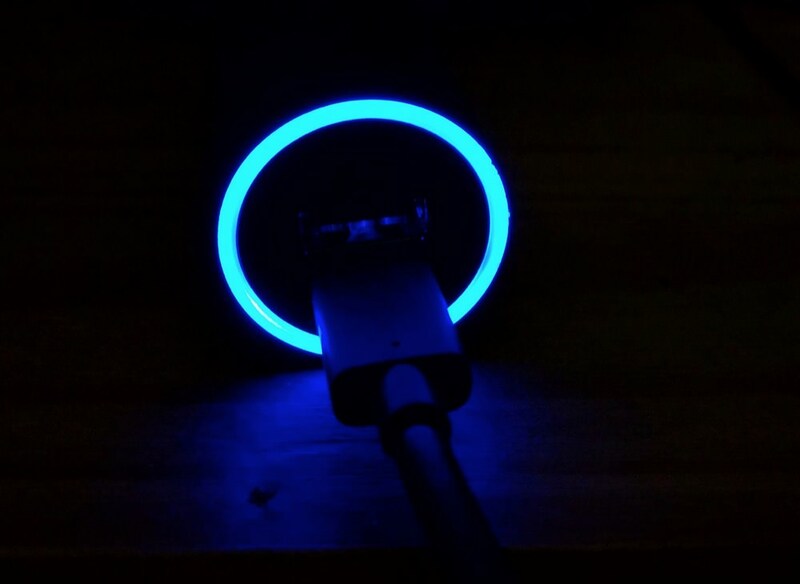 Having to press a button on other power banks and then squint at the right angle to see the tiny status LEDs was always a bit of a pain, but the auto-showing ring LED strip here is just perfect. Red for 'low', green for 'somewhere in the middle' and blue for 'fully charged'. So you always know roughly where you stand. 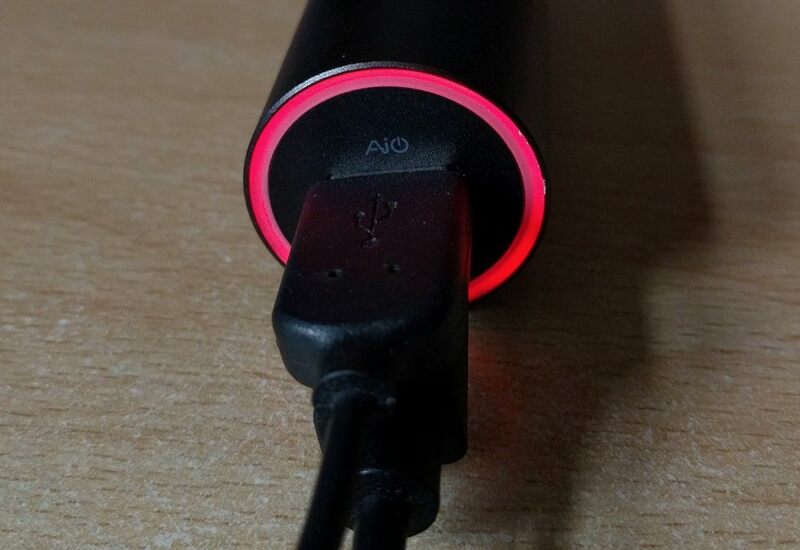 True, a digital indicator, as on the Veho Pebble, would have been much more accurate, but then charging from a 5000mAh source (here, at 3.7V) to a 3000mAh-ish flagship smartphone doesn't need exactness - a full charge on the AUKEY here will give you a guaranteed full charge on the phone (from empty), and with a bit left over, but not enough to worry about. Although there are two ports here, as shown, and although the 'Halo' charges two devices simultaneously very happily, it's not really designed for a use case like this. 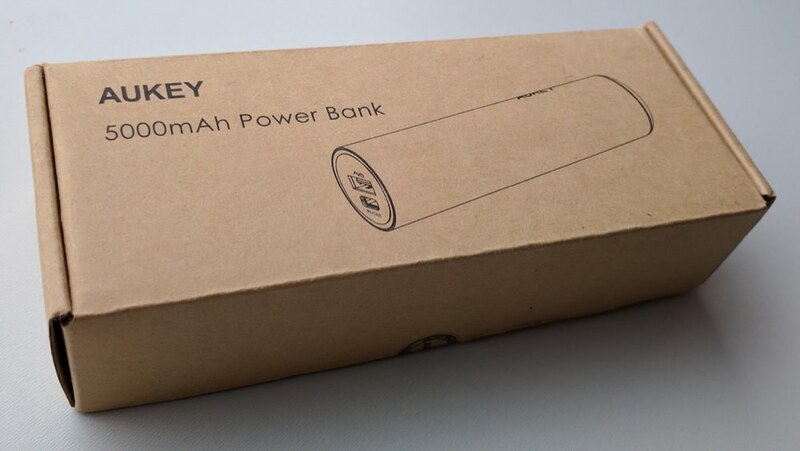 After transfer inefficiencies, you're essentially just carrying around that one full charge for a top end gadget and this is sized as a 'personal' charger. 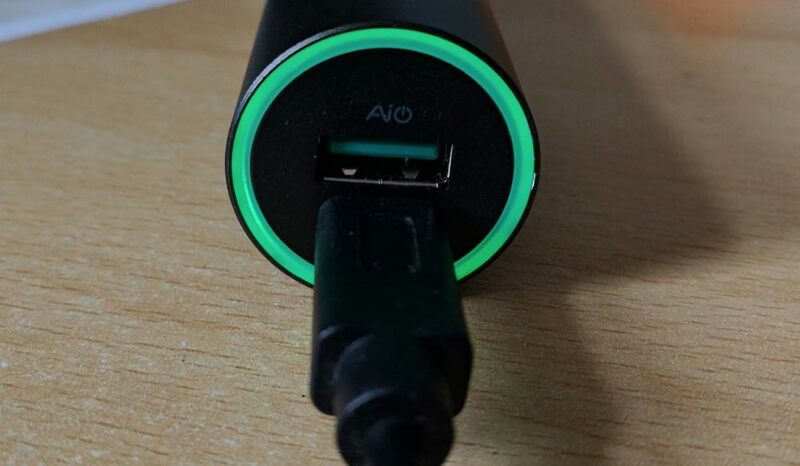 The USB Type C port is the main input and way of charging the 'Halo', accepting 2A at 5V, so it takes about two hours to fill from scratch from a high current USB source (such as a suitable mains adapter, not supplied). The same Type C port can push out the full 3A from the USB 'Power Delivery' spec, while the green-bladed USB Type A 'smart' port can output a maximum of 2.4A to any device over its own charging cable, intelligently querying and testing the device and adapting voltage and current as needed. These smart ports do seem to work well and the AUKEY charger here worked with everything I threw at it. 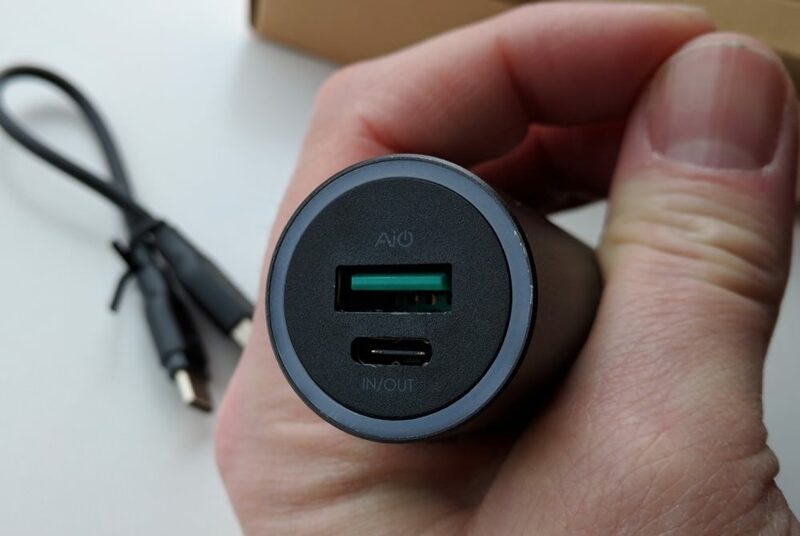 The smooth and strong metal build, the buttonless design, flexible output and, most of all, the 'halo' charge status indicator, all add up to this AUKEY gadget being something of a pocket classic. It's currently showing at just under £19 on Amazon UK, which is slightly on the high side for a charger of this capacity, but then it is well made and it is innovative. Recommended.